GUANAJUATO: the crown jewel of Spanish Colonial cities in the Mexico highlands! Settled in the 1550's, the city looks more like towns in southern Spain, Italy, or Portugal than most in Latin America. Exceptionally mild climate at 6600 ft above sea level; amazingly diverse and cosmopolitan arts. Annual Festival Cervantino runs through most of October and with performers and artists from across the world. This beautifully renovated house is in the center of Guanajuato, within minutes' walk of the Mercado Hidalgo, Jardin de la Reforma, Plazuela de San Fernando, Alhondiga, cathedral, Jardin Union, Teatro Juarez, and Festival Cervantino venues - the heart of the best Colonial Highland town in Mexico - two blocks from the 'Callejon del Beso' (alley of the kiss) above Plaza de los Angeles, and on one of few streets accessible by car in the Zona Centro (but we discourage driving large vehicles - Suburbans or big SUVs - down our narrow one-way street). Tall Colonial-style wood beam ceilings in living room and one bedroom - both with shuttered window embrasures facing street. Bedroom has double bed, closet, and full set of Colonial-style furniture. Double keystone arches separate large living room from dining room with formal dining table. Complete kitchen with all appliances - gas stove, dishwasher, refrigerator, microwave - and a complete set of cookware and colorful tableware for six from Talavera Vasquez in Dolores Hidalgo. Washer and gas dryer in utility area next to kitchen and first floor bathroom and shower. 2 bedrooms - a master suite with king bed and bath en suite, with 3 French doors opening onto small balconies overlooking Callejon San Cristobal; and a second bedrooom with double bed and casement windows opening onto interior stairwell, and large bath adjacent. A reading room on second floor - with a huge sliding window wall and balcony facing the city center - has a loveseat that folds out into a large twin bed. Glass block skylights flood natural light into stairwell, second bedroom, hallway, and baths while affording privacy and security. the entire roof of the house is made up of two terrazas with seating and tables for 6 on lower terrace and large pavilion with table and seating for 4 on upper terrace; breath-taking views of Zona Centro and most of the city and surrounding mountains. tankless hot water heater supplies entire household without problems. 3 baths have gorgeous talavera sinks and tiling (as does the kitchen). Linens and towels supplied. Localizacion: Guanajuato, Gto. En el centro de Mexico. Ubicada en la zona centro de la ciudad de Guanajuato). Alojamiento: 3 recamaras, sala, comedor, cocina, 3 bajos y dos terrazas. Alberga de 6 a 8 personas. GUANAJUATO: Joya de la corona de las ciudades Coloniales espanolas, Localizada en las regiones montanosas de Mexico! Fundada alrededor del ano 1550. La ciudad se parece mas a pueblos en Espana del sur, Italia, o Portugal que la mayoria en America Latina. Con clima excepcionalmente bueno, a 2,000 m sobre el nivel del mar. En la ciudad conviven las artes increablemente diversas y cosmopolitas. El Festival Cervantino, cada mes de Octubre ofrece la actuacion de artistas de todo el mundo: teatro, danza, musica, artes visuales, opera, etc. Es una casa bellamente renovada, en el centro de Guanajuato. Funcional y confortable. A una distancia de pocos minutos, caminando, de los puntos de interas en el centro; como: el Mercado Hidalgo, el Jardin del la Reforma, la Plazuela de San Fernando, la Alhondiga de Granaditas, la Catedral, el Jardin Principal (Jardin de la Union) el Teatro Juarez y la mayoria de los sitios atractivos. Localizada a unas cuantas casas del 'Callejon del beso' sobre la Plazuela del los Angeles, es posible el acceso en automovil. Sala y recamara con techos altos de vigas de madera y losas de terracota. Ambos espacios cuentan con postigos de madera en las ventanas, las cuales est?n enmarcadas en piedra calc?rea y tienen alf?izar que da a la calle. La recamara de la planta baja cuenta con cama matrimonial (doble) armario, tocador sill?n estilo Colonial. Dos arcos de cantera, separan la sala del comedor, el cual tiene una mesa para cena formal. El loveseat en la sala, se convierte en cama individual (amplia). La bella y funcional cocina esta completamente provista con todos los aparatos: estufa de gas, lavavajillas, refrigerador, horno de gas, horno de microondas. Bateria de cocina completa y vajilla Talavera, con cristaleria, para seis personas. Area de lavandera con lavadora y secadora de gas. 2 Recamaras, la principal con amplio bajo. Amueblada con cama King size, tocador, buroes y butacas. Amplio closet. Cuenta con tres puertas francesas que abren hacia balcones, a la calle San Cristobal. La segunda recamara tiene cama matrimonial (doble) tocador, closet y ventanas de la ventana de abren sobre la escalera interior. Tiene un bajo grande adyacente. El area de lectura, con ventana corrediza grande y balcon hacia el centro de la ciudad. Cuenta con un loveseat que se convierte en cama individual amplia. Los tragaluces inundan de luz natural la alegre escalera, la segunda recamara y el vestibulo, permitiandose el lujo de retiro y seguridad. En la parte superior, hay dos terrazas, con sillas y mesas. La parte mas alta tiene un pabellon abierto, con sillas y mesa para cuatro personas. Goza de una vista espectacular, hacia el centro de la ciudad y las montanas circundantes. El calentador de agua, proporciona agua caliente proporciona simult?neamente, sin problema. Cada uno de los tres ba?os est? bellamente decorado con azulejo Talavera, al igual que la cocina. Se proporcionan blancos (toallas y s?banas). 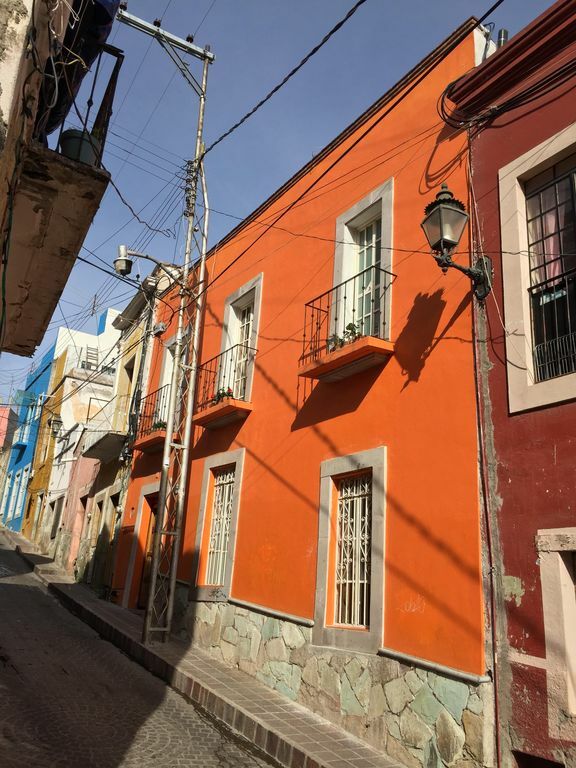 We quite accidentally spent a week in Guanajuato during the brief time between the Festival Cervantino and la Dia de los Muertos and were swept away by the visual and musical beauty of the city. Just go - you will not regret it! within 5 minutes' walk of main public market (Mercado Hidalgo) and the city center, accessible by car, and within 10 minutes' walk of almost all public performance venues in town. Master bedroom has en suite bathroom with large shower, toilet, sink; 2nd floor hall bath has large shower, toilet, and sink, and we keep a hair dryer in the drawers or cabinets below the sink; 1st floor bathroom has small shower and toilet with sink just outside of bathroom. Beautifully furnished and detailed Mexican colonial home . Very clean with comfortable beds and linens. Sandra , the house manager, met us on the steps of the house when we arrived. She arranged for Antonia to cater our evening meals. What a treat ! Meals were delicious and varied. Only a few short blocks down to Historic Center.